This entry was posted on Thursday, February 28th, 2013 at 5:03 am and is filed under Uncategorized. You can follow any responses to this entry through the RSS 2.0 feed. You can leave a response, or trackback from your own site. 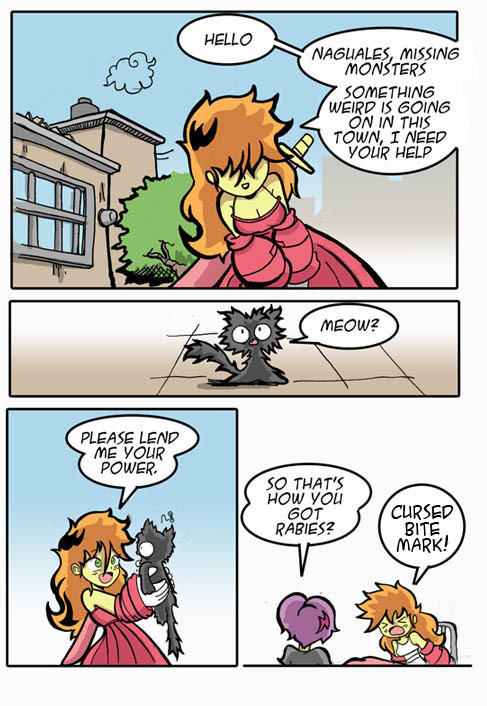 I think it would make more sense if Jynx said “Its a cursed bite mark” in the last panel. After all if I got the context right she is trying to say to Pilli that she didnt get the rabies from the cat but a curse. (As in she is not sick but cursed). rabies is truly the curse of cute animals..
we should be able to pet any we find!! !